For the Bentall Centre in Kingston upon Thames, England, see Bentalls. The Bentall Centre is a 1.5 million square foot office complex and underground shopping mall, located in Downtown Vancouver's financial district. It is owned by Anbang Insurance Group and managed by Canderel. The shopping mall under the complex is known as "The Shops at Bentall Centre", and includes approximately 50 stores and a food court. The mall has a direct connection to Burrard Station of the SkyTrain network. 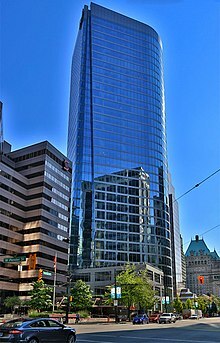 One Bentall Centre is located at 505 Burrard Street. Completed in 1967, it stands at 86 m or 22 storeys tall. Two Bentall Centre is located at 555 Burrard Street. Completed in 1969, it stands at 70 m or 18 storeys tall. WeWork is the main tenant of this building. Three Bentall Centre is located at 595 Burrard Street. Completed in 1974, it stands at 122 m or 32 storeys tall. Bank of Montreal is the main tenant of this building. Four Bentall Centre is located at 1055 Dunsmuir Street. Completed in 1981, it stands at 138 m or 35 storeys tall. It is currently the 12th tallest building in the city. Deloitte is the main tenant of this building. Bentall 5 (or Five Bentall Centre) is located at 550 Burrard Street. It stands at 146 m, making it the 8th tallest building in the city. The first 22 storeys were completed in September 2002 by Musson Cattell Mackey Partnership, and floors 23 through 34 were completed in late 2007 by EllisDon Construction. On January 7, 1981 four carpenters were killed while constructing Bentall Four . They were preparing a platform known as a 'fly form' (see formwork) for the last concrete pour on the roof, when it broke free. Without warning the fly form; known as 'fly form E', fell over the edge and carried the four men to their deaths. The news of this horrific accident shocked people across Canada and around the world. On February 23, 1981 the Coroner's Inquest was held in Vancouver. It would be referred to as a marathon inquest, since it went into the eighth day with 30 witnesses being called upon to testify. Anthes Equipment Ltd was the company that designed and supplied the fly forms to the contractor building the tower. Anthes Equipment Ltd of Toronto was not registered to be working in BC at the time of the accident; leaving them liable to civil action. The equipment they supplied was also non-compliant with the specifications required in BC at the time. One of the widows; Carol Davis, individually filed a writ on February 19, 1982, in the Supreme Court in an unprecedented action against Anthes Equipment Ltd. The other families elected to allow the Workers Compensation Board to sue on their behalf. On February 23, 1984; the fourth day into the trial, Carol Davis accepted an out-of-court settlement from Anthes Equipment Ltd.